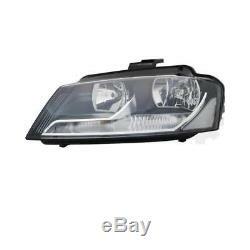 Headlight set kit for audi a3 8pa year fab. This product page has been automatically translated. If you have any questions, do not hesitate to contact us. 1x halogen headlights right (passenger side). 1x halogen lights on the left (driver's side). Audi a3 8p 8pa bj. 08-12 sedan / facelift sportback. Only for traffic on the right. Approved Road Traffic Regulation (free registration) e-marked. Participate with the comparable erstausrüsterprodukt with an excellent fit. Pour vehicles without xenon lighting for vehicles with leveling (electric) lights. Right (passenger side) left (driver side). Light bulbs are not included, but are available for a fee in our shop. If you wish, we can also advise you in choosing the right bulbs. Servomotor for ldr (lighthouse leveling). H7 / h7 p24w py24w w5w. With daytime running lights with low beam with indicator with high beam with position light. Driving on the left only. Plug & play (easy installation with vehicle-specific connectors and original mounting points). No error message when you board computer. 4a0941699; 8p0941004aj; 1nl006150071; 8p0941003bb; 1nl006150081; 4a0941700; 8p0941004bb; 8p0941003aj. 8p0941004aj; 8p0941003bb; 8p0941004bb; 4a0941699; 8p0941003aj; 4a0941700. Our service does not stop for you, with the sale of goods. Headlights, headlamps, head lamps, head lights. 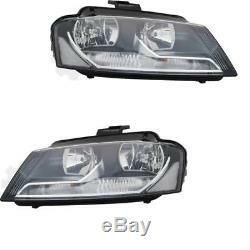 The item "headlight set kit for audi a3 8pa year built 08-12 h7 / h7 incl Engines" is on sale since Sunday, December 9, 2018. It is in the category "auto, motorcycle parts, accessories \ auto \" spare parts \ optics, lights, turn signals \ front lights ". The seller is "qrparts24" and is located in leipzig.